Fenugreek seeds have a long history of use as a spice and an herbal medication, particularly in India, Egypt and the Middle East. Currently, fenugreek seeds are used to treat high cholesterol, diabetes and appetite loss. 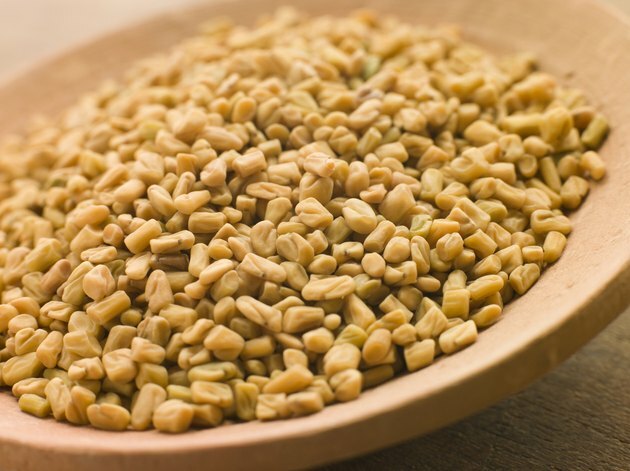 Fenugreek seeds can also help stimulate lactation in breastfeeding women. As a commonly used spice, fenugreek seeds are generally safe and well tolerated. However, when taken in large amounts, fenugreek seeds may cause side effects. As with any health supplement, you should consult your doctor before taking fenugreek seeds as an herbal medication. High doses of fenugreek seeds, such as more than 100 grams per day, may increase the risk of side effects, especially in the gastrointestinal system, according to a report from the University of Michigan Health System. Common side effects include upset stomach, nausea, gas and bloating. In severe cases, diarrhea and abdominal cramps may occur. Taking fenugreek supplements with a meal and breaking up large doses into several smaller doses throughout the day may decrease the risk of these side effects. Taking fenugreek has also been reported to cause a body odor that smells like maple syrup. Historically, fenugreek seeds have been used to induce childbirth because large doses of fenugreek can induce uterine contractions, explains the National Center for Complementary and Alternative Medicine. Taking concentrated extracts made from fenugreek seeds may cause unpredictable effects in pregnant women, including premature birth or miscarriage. If you are pregnant, you should consult your doctor before eating large amounts of fenugreek seeds or taking fenugreek supplements. Fenugreek extracts can lower blood sugar levels. While this effect might be beneficial for people with diabetes, if fenugreek supplements are taken at the same time as other medications that lower blood sugar, levels of blood sugar may drop dangerously low. If you have diabetes or are taking medications that affect your blood sugar, you ask your doctor about possible interactions with fenugreek seeds or extracts. Because straight fenugreek seeds have a bitter taste, they are often taken in capsule form when used as an herbal medication. For diabetes, fenugreek supplements are often taken at a dose of 5 to 30 grams, three times per day, reports the New York University Langone Medical Center. Concentrated extracts made from fenugreek can be taken in smaller amounts, such as 1 gram per day.